I earn my living behind a lens now, but sometimes my lingering reporter’s curiosity gets the better of me. Such was the case when I was sent to shoot a standalone photo of students from the Regina Trades and Skills Centre repainting the inside of Regina’s Bright Beginnings Early Childcare Centre. After I made a few frames, I engaged in what is one of the few verbal aspects of my job. “Could I grab your name?” I asked one of the students. Akintunde Agbeja kindly said and, upon request, spelled his name. Interesting accent, I thought to myself. Why not ask? “Where are your from, originally?” I asked him. Nigeria. He’d arrived in Canada eight months prior. Akintunde Agbeja, right, is seen sanding down a shelf at the Bright Beginnings Early Childcare Centre in Regina. Oludare Akinwale can be seen behind. Why had he chosen to learn painting? Well, in fact, Agbeja had worked for around 15 years as a civil engineer in his home country. His experience and credentials hadn’t translated into a job in Canada. 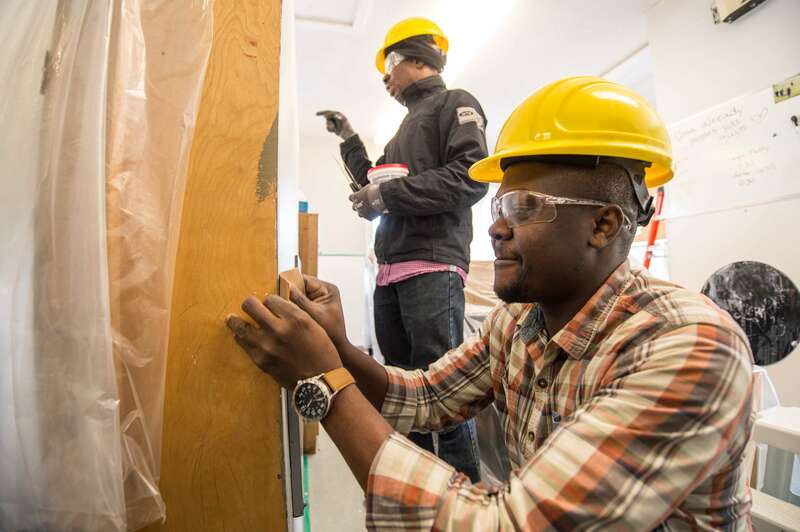 He felt like he was starting over, but he viewed learning a skill like painting as a step toward a greater understanding of the Canadian construction industry — a determined first step back toward his field. Among the small painting group, there were others who’d come to Canada from abroad. Zaman Rahmani was from Iran. Nara Magsarjav was from Mongolia. Oludare Akinwale was also from Nigeria. Zaman Rahmani, originally from Iran, came to Canada more than three years ago. 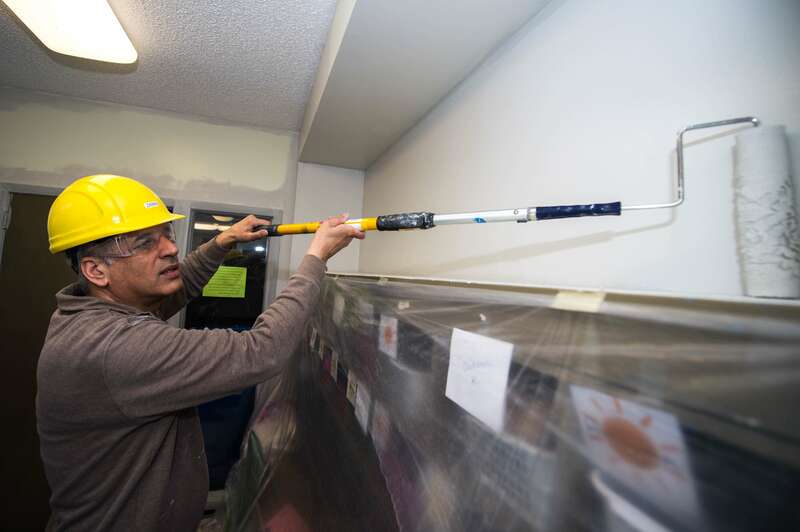 He is seen painting here at the Bright Beginnings Early Childcare Centre in Regina. I was curious as to whether the diversity in the painting class was an exception, so I dropped by the Regina Trades and Skills Centre and had a chat with its executive director, Brian Shankowsky. 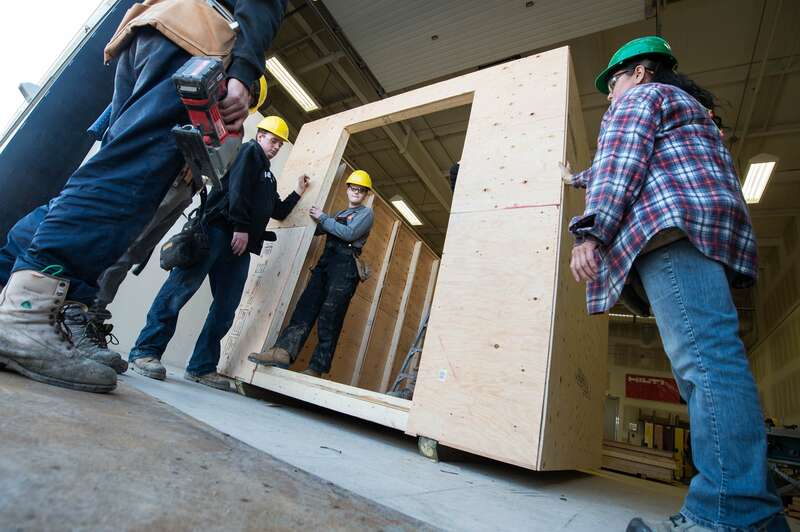 Members of the carpentry class at the Regina Trades and Skills Centre in Regina erect a wall on the side of a training building. Instructor Pat Fayant, a red seal carpenter, can be seen on the right. “We pick our students here based on suitability for the career,” he said, noting that the selection process includes examining a student’s related work history, practical testing and a discussion about the student’s desire to work in a given industry. Further, because of funding received largely from the provincial economy ministry, students pay no tuition. They are paid a wage to attend. But like a job, if they don’t attend, they’re not paid. For the 2017/2018 year, the school will receive nearly 1500 applicants, according to Shankowsky. Of those, only about 160 will make the cut. As of late March, figures showed 38 percent of students were landed immigrants. Those from abroad have a variety of reasons for wanting to enrol. Some, like Agbeja, have training that is not recognized in Canada. Others just need to learn the “Canadian way of doing things,” as Shankowsky puts it, meaning standards, regulations and the like. Some have reasons unique to their situation. All of them want to find work in what Shankowsky terms an “employer’s market” fostered by the current economic climate. 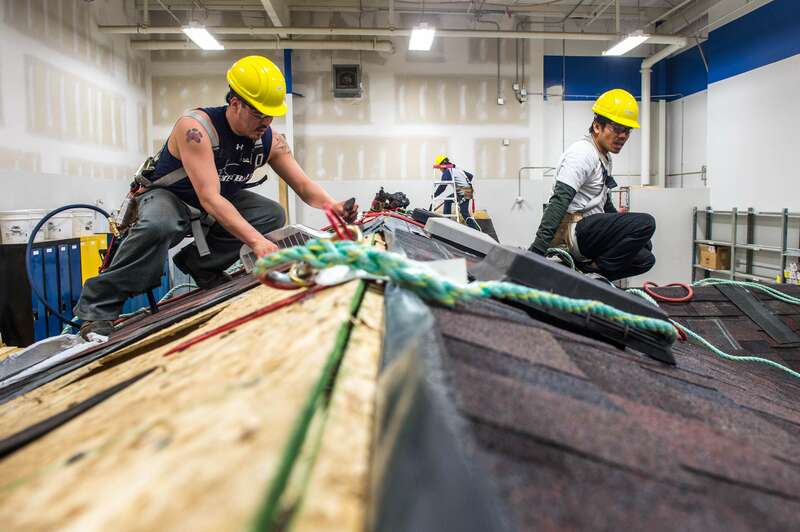 Ulysses Patingo, right, originally from the Philippines, works on a mock roof at the Regina Trades and Skills Centre in Regina. I found the 40-year-old in one of the school’s shops, atop a mock roof that he and his classmates were busy repairing. Back home, he worked in a kitchen, but didn’t make much money at it. Now, the 40-year-old is learning to be a roofer. He has a 16-year-old daughter and hopes to get a job in the industry to help support her. If it all works out, he hopes to open his own business. I later saw Patingo pitching loads of stripped shingles off the roof of a home on Regina’s 8th Avenue, as part of his practical training. 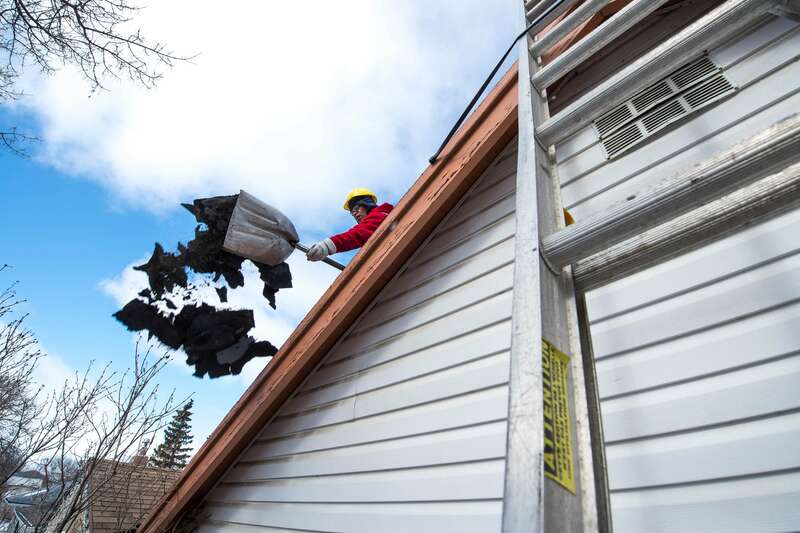 Ulysses Patingo, a member of the roofing class at the Regina Trades and Skills Centre, pitches old shingles off a roof during a roofing exercise on a home on 8th Avenue in Regina. That’s right up his alley. “Some people play cricket, some people play hockey. This is my hobby,” he said, taking a quick break from building a small, wooden flower planter — a class project. 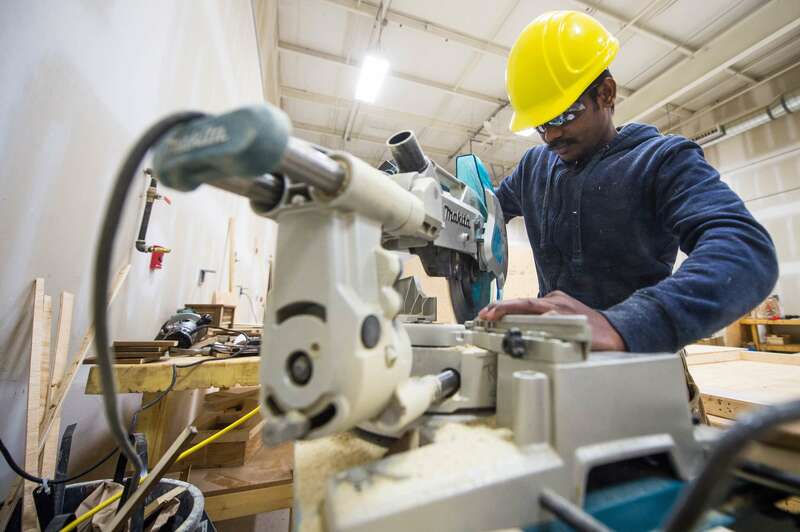 Manikandan Nandakumar uses a mitre saw while building a small planter as part of the carpentry class being held at the Regina Trades and Skills Centre in Regina. He tried to get a carpentry job upon arrival, but was unsuccessful. He hopes to remedy that after completing his course. If all goes according to plan, he wants to get some industry experience and then, perhaps, open a cabinetmaking business with fellow classmate Ganesh Adhikari. Adhikari is also from India, arriving here in 2013. The 32-year-old did not know Nandakumar in their home country, but the pair became friends in Canada and have worked together on construction projects. When Nandakumar applied for the course, Adhikari followed suit. 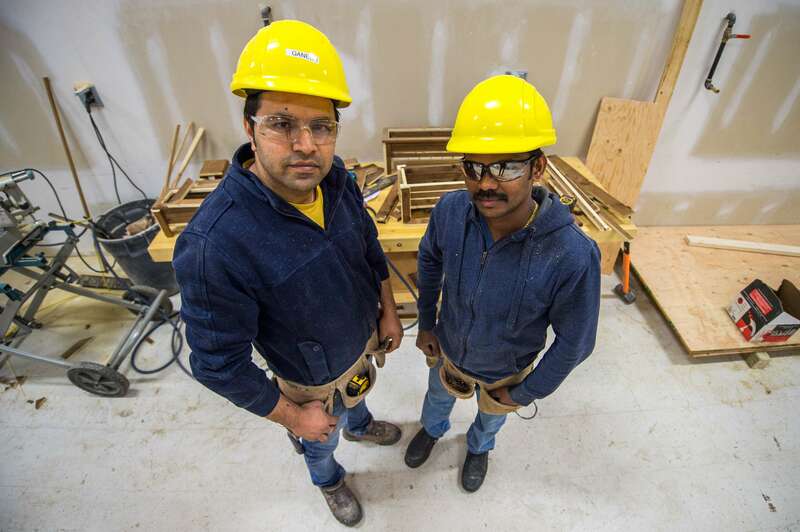 Manikandan Nandakumar, right, and Ganesh Adhikari, both originally from India, pose for a portrait in the carpentry workshop at the Regina Trades and Skills Centre in Regina. 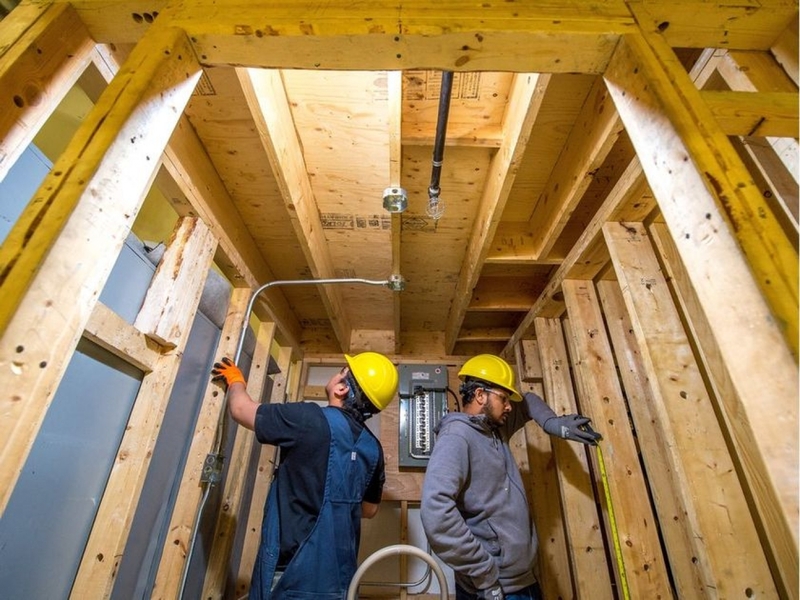 Walking into the electrical shop, I watched as Leo Gamoso and Ajay Kumar worked together to install electrical fixtures and conduit into a mock commercial building. Gamoso came to Canada in 2010 from the Philippines where he worked as a clerk for an electrical company. Since arriving in the country, he’d be working as a landscaper. His wife just finished training to be a nurse. “She told me, ‘Now it’s your turn to study,’ ” he said. He sees electrical work as a good way to support his family and provide for his two boys, aged four and one. One day he would like to be a Journeyman electrician. 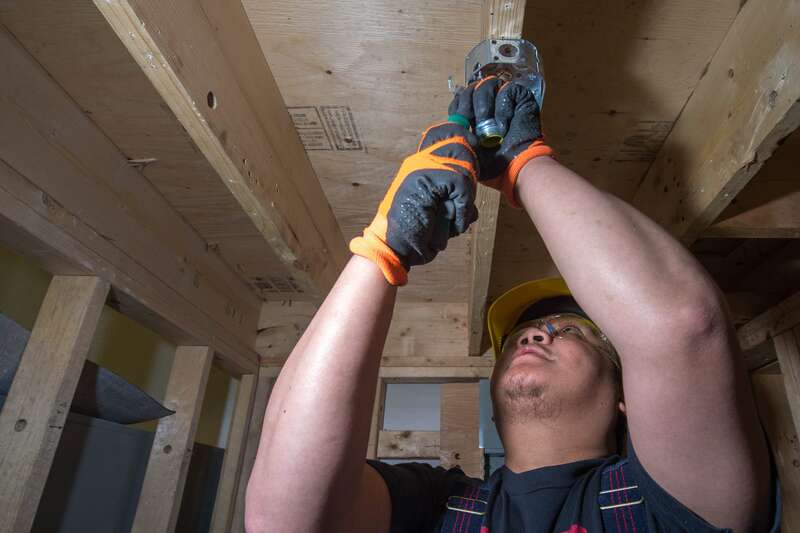 Leo Gamoso, originally from the Philippines, installs a light fixture as part of an exercise being conducted by the electrical class at the Regina Trades and Skills Centre in Regina. Kumar, originally from India, actually came to Canada in 2012 with the intention of studying. He wanted to expand on his previous education as an aircraft maintenance engineer, which he’d been using to work as a technician for an airline. However, after arriving the 29-year-old realized that many of his previous courses wouldn’t transfer to a Canadian post-secondary institution. He also fell ill and required an operation. Between that and the added cost of having to retake some of his classes, he decided to drop out of school. 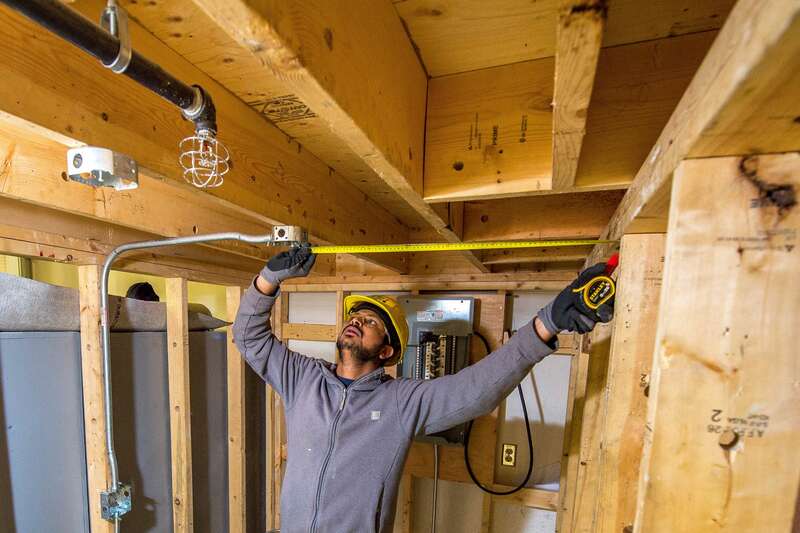 Ajay Kumar, originally from India, measures before building an electrical conduit as part of an exercise being done by the electrical class at the Regina Trades and Skills Centre in Regina. He worked at Home Depot and then a luxury granite company. But he got laid off, so he took a job at McDonald’s. Electrical work was something he’d studied as part of his aircraft maintenance education in India, so it was a natural place to pick up. While he hopes to earn a good wage after completing his course work, money isn’t the only reason he wants to enter the trade. “I’m interested in that, when I’m going to do the work with my heart,” he said. When my heart is in my work, it’s most often because I’m feeding the curiosity that landed me in journalism to begin with. Turning what was assigned as a single photo into this piece has allowed me to to just that. 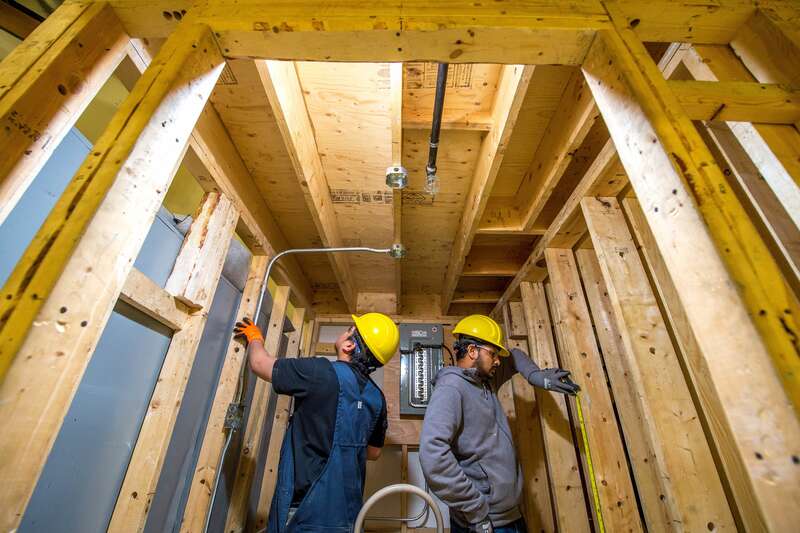 Leo Gamoso, left, and Ajay Kumar work together to wire a small room during an exercise being held by the electrical class at the Regina Trades and Skills Centre in Regina.